... What is the follow-up / action? Yves: I can do it. Tim: The "grandfathering" option [wasn't a good one]. It's possible we can eliminate one of the other options. Yves: Should we contact Chris? Nail down what the issue is first? Noah: To be picked later at 11:15. ... We had a discussion on day 1 on HTML-XML reunification. Let's come back to it. ht: this is in reference to HTML wg issue 41.
ht: interesting thread - subject "facebook have started facebook namespace declaration to connect web pages to facebook"
... the assertion is that there are thousands to millions of html pages with namespace declarations in them (other than the XHTML namespace). noah: David R from Facebook presented on this at WWW. Said: we don't think people will get namespaces right. ... also, this is in service to RDFa. So resolution to Qnames isn't happening. tim: so facebook are using RDFa. ht: with the binding for the curie. ... what's crucial is that the namespace binding be in the DOM. tim: for people doing interesting things with RDFa in scripts it's important. for Facebook maybe not. tim: actually - james clark's [XML parser] strips the namespace bindings out. ht: it illuminates sentiment in the [html] working group. There's a sense of "don't break the Web" - now there are all these pages that are using namespace bindings. That's relevant info for discussion of [html] issue 41.
noah: how is that going past www2010? ht: hasn't come back up again. not currently on the front burner. ... the fact that Facebook did their design the way they did is relevant. ht: html wg issue 41 is open - not currently being discussed. we could take the initiative and put forward our preferred proposal. ... the most committed pushback from HTML wg is in the area of the DOM API. ... it comes back to polyglot documents - ref HTML authoring guidelines draft of 27 may 2010.
ht: is there a succinct discussion of what the XML spec requires of a conformant XML processor and what the HTML spec requires of an XML-mode processor? ... seems this spec does call for a conformant XML parser. So it's behaving like what the XML spec calls an application. noah: intent [of this document] is to talk about XML as conventionally processed. it's about writing HTML which is processable as XML. yves: if you have an SVG tag in the DOM do you have the namespace? tim: when SVG is parsed it's given the SVG namespace int he DOM. < noah > I like the document a lot. I can't necessarily say that the details are right, but the tone and structure seems to me to be very effective, and I assume most of the details are right. < trackbot > Created ACTION-440 - Ask Hixie what is meant in this [section 9.2] by "retrieving an external entity" and could some clarification be added. [on Henry S. Thompson - due 2010-06-16]. ht: we need to get clear just how close the DOMs are - suppose I follow the polyglot recommendation. Is it really true that the DOMs are the same regardless of which way it gets processed? ht: phrase that's in the spec: 2 sets of rules for processing html documents: one set for html, one set for xhtml documents. ... are these three distinct in terms of what they build? ... I assume that [polyglot spec] is talking about the latter two modes. < noah > So, my feeling is there are a few use cases here. < noah > The compatibility document correctly points out that one use case is to use generic XML tools, and that's indeed important. < noah > Nonetheless, when we talk about polyglot, our fundamental concern is that there be compatibility when the same bits are served >to HTML5 processors< in two diffent modes: 1) as text/html and 2) as application/xhtml+xml. < noah > It's also nice if the DOMs built by other XML tools are similar, but those tools won't do things like scripting, so are ultimately a different use case. < timbl > style. Polyglot documents meeting these constraints may be interpreted equally well as XML or as HTML5. < ht > Turns out it is a parse error in HTML parsing mode if you start an element with _anything_ other than a-zA-Z ! jar: what should our internal message be regarding namespaces? What seems to be getting lost in arguments is connection between specific situations and high-level goals TAG and W3C is trying to promote. E.g. self-dscribing Web. ... I'm worried about losing track of requirements as we make choices about what technical approach to take. noah: I think there's a fundamental disagreement in the community on high-level goals around distributed extensibility. noah: when you raise with languages and systems a question of who gets to write new specs and who gets to extend them... that's important. ... members of the community have different views of the importance of allowing distributed innovation. ... if [we] could bring together a group of people who could show how [distributed extensibility] can be done that could be useful. ... what I would like someone to do is what I've been trying to do with persistence. Try to lay out and compare all the different solutions so we can compare them on criteria whose meaning we agree on. < ht > "Document objects are assumed to be XML documents unless they are flagged as being HTML documents when they are created. Whether a document is an HTML document or an XML document affects the behavior of certain APIs and the case-sensitivity of some selectors." jar: would like to [frame the question] as "what do you have to do in order to extend the language"? Operationally. ... we ought to be able to lift up the analysis a level to get more engagement. ht: practical advantage of this approach is that it doesn't start with a discussion of syntax. tim: introducing indirect namespace could be a way of decoupling these things. < noah > We're about to take a break. < noah > Speaking of which, I will shortly be asking TAG members to send hints on which weeks the are/are not/might not be available for summer telcons, so if you have a chance to email that it would be helpful. < noah > Take care. +1 to jar's comments on describing things operationally. < noah > Thank you so much for doing it. tim: I think [the polyglot spec] should be normative. noah: Could someone take an action to draft a response for our review? Then tim review. tim: it should be written as a subset of documents. it shouldn't be called guidelines. like a profile of a language. noah: I read it and liked it. If I were writing html documents, this is what I'd want. ... eg it had good guidelines in it - good practical advice. tim: in some cases they don't give this information - they don't explain why. noah: points to notes on use of CDATA in polyglot spec. ... can anyone take an action to draft a strawman proposal? ... We could bring it up in the next telcon. tim: we could do it here. noah: we could do it in the afternoon. ... break for 20 minutes. noah: we need consensus of what feedback TAG should give if any on the compatibility document. ... this document [the guidelines doc] is more for content authors. noah: I am also curious for some of these things: this document says "if you want something that's completely polyglot then here's your rule", "if you want mostly polyglot but differences in the DOM then do it this way"
... this is signalling to the user that it is a matter of degree. jar: tim, you want it to say "if you do x you get the following benefit". noah: let's move forward. let's try to get some of the technical work done here. noah: how about "XHTML / HTML Compatibility" ? jar: We're trying to change it to a spec that can be validated (against). < ht > "per the HTML5 specification regardless of whether they are processed as HTML or as XHTML"
< noah > Or "regardless of whether they are processed as HTML or as XHTML, per the HTML5 specification "
tim: apart from this are there other changes we want to see? ... there are ways of accessing the DOM that only work under one serialization. ... We could ask "are there any other aspects of DOM access aside from name matching [that need to be spelled out]?" noah: would it be worth mentioning the existence of formal MUSTs. < jar > nonnormative text. " noah: specifically at minimum all the text with formal MUSTs should be normative. < jar > I agree, "is" is better than "must"
< noah > I can live with either, slight preference for "is"
< jar > yves: So JAR is saying: All the MUST- (or is-) level requirements must be testable. tim: would only work for the class of documents that don't have scripts. < jar > my mistake, validating scripts for containment in the polyglot subset is untestable. < timbl > In general, whether the scripts "do the right thing" is not testable. ... why is tbody on this list? it's only because of scripting? ht: I want a stronger invariant. I want the promise of polyglot documents that they produce the same DOM and tbody violates that. noah: 6.1.1 says "a table must have a tbody"
tim: I agree with what they've done. ht: I'm interested to know how big the list of [exceptional cases where the DOM is different] is. tim: I think one of the nice things about this is that it gives a recipe. ht: I think [tim and myself] are in violent agreement. noah: do we have consensus from those in the room? If so, should we wait for those not in the room? < timbl > PROPOSED: To pass http://www.w3.org/2001/tag/2010/06 on to the authors as feedback from the people here present. < timbl > logger, pointer? jar: [we should] just do it. issue stays open becuase there is other work on it. This is a continuation of the discussion from yesterday (8 June 2010). 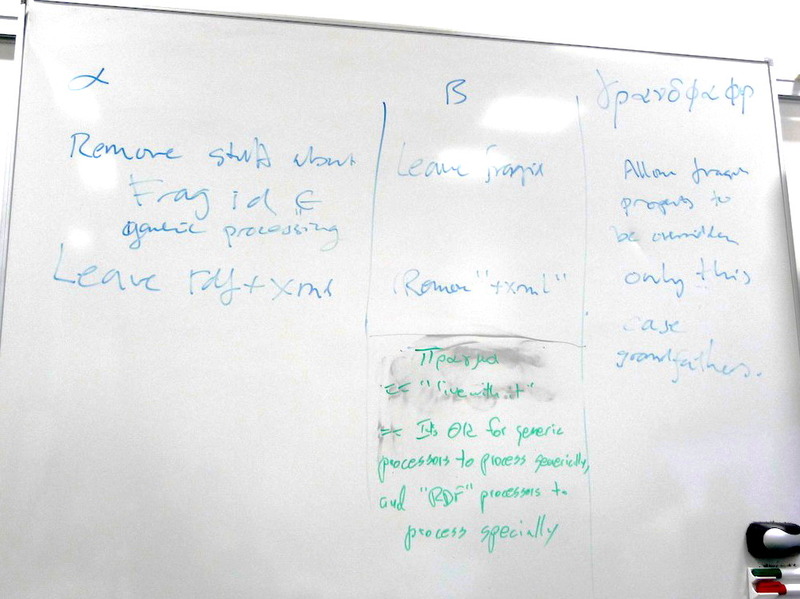 NM: # During our discussion on 8 June, we noticed what appears to be a conflict between the fragment ID semantics for media type application/rdf+xml, and RFC 3023 as published, and also with proposed revisions to RFC 3023 (see also section: A Naming Convention for XML-Based Media Types). We agreed to continue the discussion on 9 June. AM: We are going to recoomend alpha, correct? jar: Is there really a conflict in XML Processing? < noah > 2) The tool follows the link, gets back application/rdf+xml. Unfortunately, when I wrote the tool, I had not read the spec for rdf+xml, but I had read the 3023 and/or 3023 bis specs. HT: Do generic XML processor XML as XML? < jar > Here's my example: in http://example.com/w rdf+xml I say <foaf:Document id="zzz"> <owl:sameAs rdf:resource="http://example.org/x"/> </...> ... then the browser (a generci xml tool) follows href="http://example.org/w#zzz" - should it (should ie be allowed) to go to example.org/x ? or to the rdf:Document element in example.org/w ? ... but why would you load both in the same triple store? ... I would remove the para fron 3023 that starts "Fragment Identification -"
< jar > "XPointers (see Section 5) can work with any XML document"
< noah > Probably true, Jonathan, but if you're implying that we can leave the architecture "broken" just because no current software badly misbehaves, I'm unconvinced. henry: you can't use fragment identifiers. noah: this is a red herring. noah: [back to proposals] back to proposal a (alpha). < timbl > Well, red herring ecept that as Yves points out is demos that you really can't use fragids with generic processing. ht: one way to get an xpath data model is to point a conformant processor at anything. noah: web arch says "follow your nose"
HT: Says "internal structures of XML Processors"
< ht > "A software component that identifies subresources of an XML resource"
< ht > I am concerned that by losing the notion of generic processing as legitimate for at least barename fragids, we are losing real value. . .
< noah > Note will be sent for TAG internal review, with 4 day speak or hold peace window. < trackbot > Created ACTION-441 - Draft proposed TAG comment on 3023bis regarding fragment ID handling [on Noah Mendelsohn - due 2010-06-16]. NM: We are done with this agenda item. < trackbot > Created ACTION-442 - Trya nd integrate NM and TVRs words into a coherent draft [on Ashok Malhotra - due 2010-06-16]. JAR: Are there any issues here? ... he did not want Google Maps case because "everyone knows that". jar: Does thic touch on media-type registration? ... how do you follow your nose if there is a frag-id? < trackbot > Created ACTION-443 - Chase down what specs say regarding looking up fragid in 2nd representation if not found in 2nd representation [on Jonathan Rees - due 2010-06-16]. < noah > ACTION-433 is overtaken ACTION-437. Closing 433. < noah > JAR: I'm on the way to proposing that is same as AWWSW work. < noah > JAR: Maybe we don't need to track it? Those are all good people? ACTION-368 Jar will send mail to DanC saying you can close 368 if you want to. DKA: I have been looking at this. < noah > DA: Maybe you partially answered: what do you think the TAG can do? < noah > DA: One thing to say it's "not nice", but we don't have police powers. < noah > JAR: To mark a response as "never expires, the response server sends a response saying it responds with a date in approximately 1 year"? < jar > "HTTP/1.1 servers SHOULD NOT send Expires dates more than one year in the future." < noah > NM: The problem is, it's really hard to write a normative, enforceable spec, that tells you when you MUST retain a representation for resuse. < noah > NM: Lacking that, this is a hard problem to solve.